The “quaddlers” will be getting a new place to play come this April. A new playground under construction next to the Early Learning Center is set to be complete sometime in April, according to project manager Lauren Daniels. The center’s toddlers, whom students might know as the “quaddlers” due to their frequent strolls around the quad, will be able to use the new playground exclusively during normal business hours of the week. During off-hours and the weekends, the “Outdoor Education Center and Community Park,” as it is formally known, will be available to the public, Daniels wrote in an email. “Currently, the toddlers will go up to the campus and run around on the quad, to the gym or the football field, and so, it will be good to have a place for them to play near the center,” said Director of the Early Learning Center Jennifer Peters. They will still make some appearances on campus, she added, given that the quad gives them adequate space to run around freely. Picnic tables and a rain garden are some of the amenities that will be present in the new playground. Assistant Director of the Early Learning Center Kimberly Day said they are glad to see the addition of a new outdoor play area, as it is something that the center has been discussing for at least three years. They said it will be one of the main areas they’ll use at their facility. The playground comes as a replacement of the unoccupied police practice house which formerly stood on the plot of land. The house was demolished on Jan. 26. “Occasionally, we would get an email from the Easton Police Department or someone [from the college] saying. ‘[Easton PD] are going to be at the house, so if you see [officers] with guns, don’t panic,'” Day said. She added that families were understanding of the police’s purpose at the house and why it was important, but she thinks “since the house has been taken down, we have seen families…becoming even happier and excited,” due to the long-held playground-hopes coming to fruition. 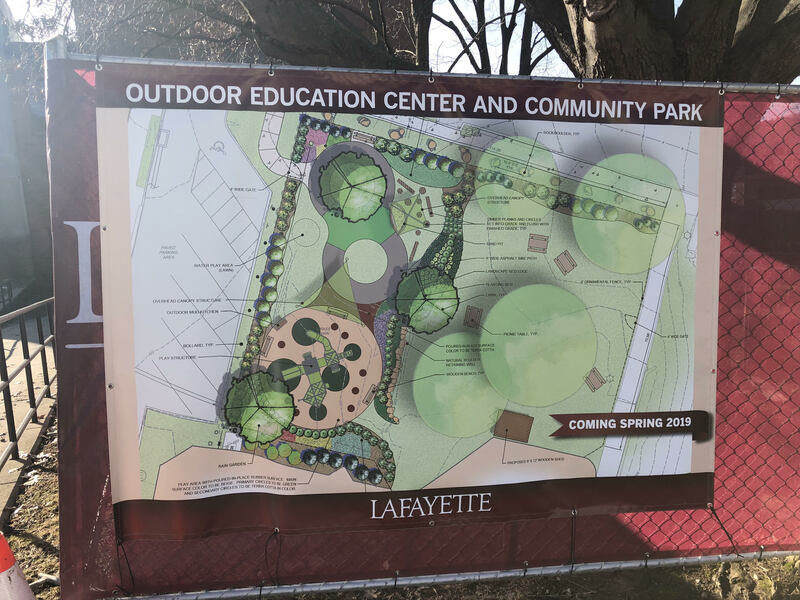 The color scheme of the park will be “natural tones,” according to Daniels, which Peters said is in keeping with the typical design of Bright Horizons, the organization that runs Lafayette’s Early Learning Center. Additionally, renovations will commence in the next couple of months on a playground at theEarly Learning Center for infants as young as six weeks old. That will only take about two weeks to renovate, officials said. Peters added that the construction will take place as weather permits. Subscribe to our print edition! Copyright © 2019 by The Lafayette. Theme: DW Focus by DesignWall.